Asagaya is located west side of Tokyo. In the first week of August, there is "Asagaya Tanabata festival (阿佐ヶ谷七夕祭り, asagayatanabatamatsurhi) which is one of the three major "Tanabata(七夕)" festival in Japan. It has the history more then 50 years. In the purl Center which is Asagaya shopping avenue there are many paper sculptures which made by local kids and shop owners in the avenue. All of them are very unique and every year, they have competition for those paper sculptures. This festival opens closely about one week in the first full week of August. There are hundreds of food stand and other shops in this festival. It is very unique summer festival in Tokyo. 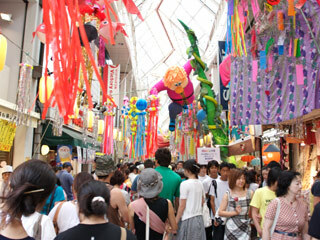 You can enjoy checking out those unique huge paper sculptures which hanged from the roof of the arcade. Most of the are made by local kids. Especially, on the weekend day, many people will join this festival. Moreover, this festival is all about food. There so many kinds of festival food you can eat. The prices of all food are generally low. You can try as much as you want.